Over the years, the vending machine landscape in Singapore have evolved greatly beyond just dispensing canned drinks. From NSF essentials to chilli crab, these vending machines have upped the convenience level for Singaporeans. To add on, there’s now a vending machine that dispenses 4D numbers. The brainchild of Jim Lee, owner of Huat Huat Vending, claims that they are the first to come up with such vending machines in Singapore. While it may be the pioneer here, such vending machines already exist in China. There are at least five such machines spread across different Chinese temples in Singapore. This includes Goh Chor Tua Pek Kong — the oldest Chinese temple in Balestier — as well as other temples in Paya Lebar, Bugis and Woodlands. Rolled out since November last year, Lee said that his firm seeks the permission of the temple’s custodians or management before installing a unit at the temple. 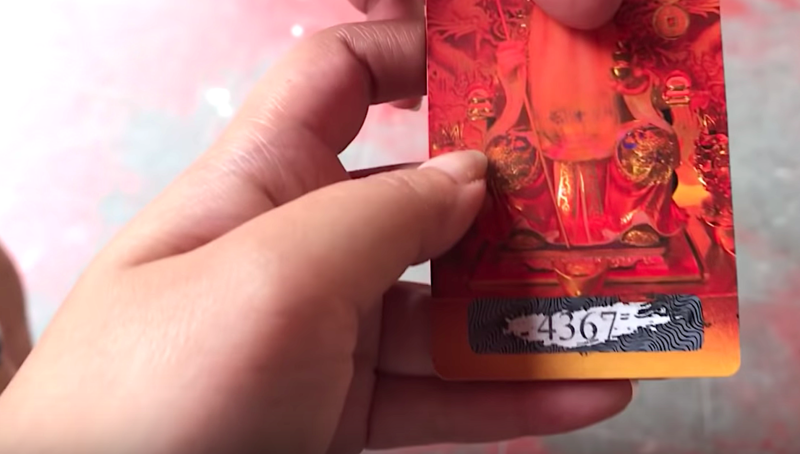 There’s a Tua Pek Kong deity figure housed within the vending machine, and it will only dispense a scratch card containing the lucky number once you feed it cash. One card costs $2, three cards cost $5 and six cards cost $10. According to Lee, these machines cost about $10,000 each to manufacture. Seeing that there are already five of such machines, it’s safe to say that his company has invested $50,000 to make these vending machines. Lee also revealed that the vending machines sell about 200 to 300 cards each month. 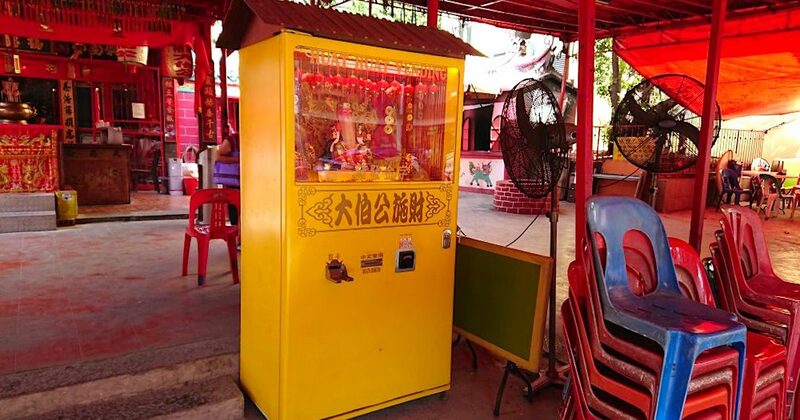 Goh Chor Tua Pek Kong temple’s caretakers told The Straits Times that worshippers primarily pray to the Tua Pek Kong deity at the temple, and the vending machine does not go against their traditional beliefs. The machine is just for luck, they said. 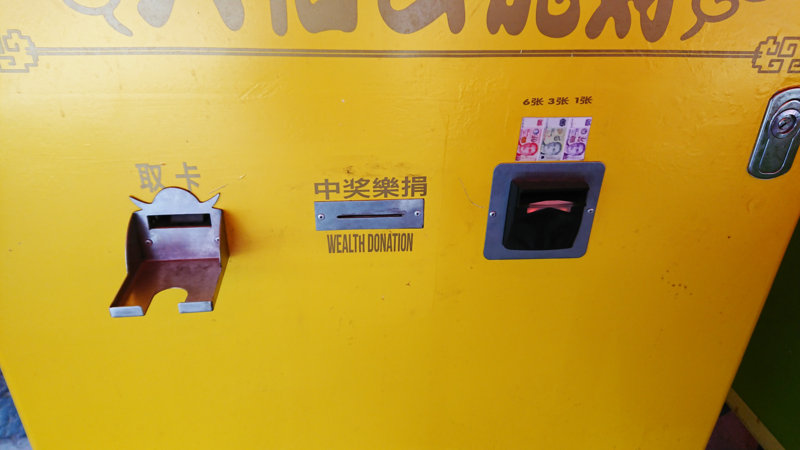 While there are no statistics on how many people have actually scored winning numbers from the machine, it’s interesting to note that the machine has a slot in the middle that says ‘wealth donation’. It’s a common practice to donate part of your winnings, even if you pray directly to the deity for a winning number. Basically, if you ever become a crazy rich Asian thanks to this machine, don’t forget to give back.